The Epistle to the Colossians is a book of the Bible's New Testament. 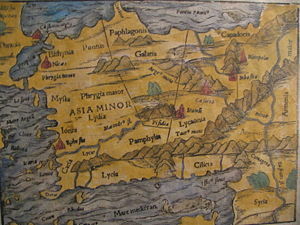 Although its authorship is disputed, the book is traditionally believed to be written by the Apostle Paul and his disciple, Timothy, to the church in Colossae. It is particularly concerned with combating a false teaching which had affected the Colossian church, apparently an early form of ascetic Gnosticism, possibly Jewish in character, which emphasized spiritual speculation about the higher powers, angels, and "wisdom." The writer(s) urged the Colossians to remain focused on Christ, whom he characterized as "before all things." Colossians represents an example of "high Christology," in which Jesus is presented not only as the risen savior, but also as the complete Incarnation of God and primary agent of creation. The letter was also significant for its rejection of asceticism and its setting forth a list of angelic orders—"thrones, dominions, principalities, and powers"—each of which became a subject of later speculation. It may also have been a model for the later Epistle to the Ephesians, which deals with several of its themes and apparently borrows several of its phrases. The author had apparently received disturbing information about a false teaching which affected the church at Colossae, a city in the Roman province of Phrygia, on the ancient Lycus River, a tributary of the Maeander. It was situated about 12 miles north of Laodicea, near the great road from Ephesus to the Euphrates. The site, located in what is now Anatolia in Turkey, has not been excavated. The gospel was taught to the Colossians by Epaphras (1:4-8), about whom little is known other than that Paul describes him as a "fellow prisoner" in the Epistle to Philemon. A large part of the letter is directed against teachers who attempted to combine mystical doctrines, asceticism, and Jewish practices with Christianity, thereby promising believers a higher spiritual life and a deeper insight into the world of spiritual beings. While traditionally attributed to Paul, disagreements exist over such things as language, style, and the presence or absence of characteristic Pauline concepts. A substantial number of critical scholars, as well as the vast majority of traditionalists, do ascribe it to Paul, however. 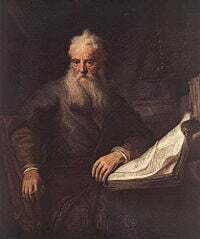 Paul's authorship is also affirmed by many of the church's early key figures such as Irenaeus, Clement of Alexandria, Tertullian, Origen, and Eusebius of Caesaria. As with many of Paul's letters, it is avowedly written not only by Paul, but also by Timothy, his disciple, who may have acted as scribe and contributed some of his own thought to this particular epistle. In terms of date, if the letter is genuine, then its date is estimated to be either around 54-56 C.E., written from Ephesus; or around 59-62 from Rome. If it is not from Paul, then its date depends on when the false teaching against which the author writes became a problem. Since the heresy appears to be an early form of Gnosticism, the date in this case is usually estimated at sometime after Paul's death and the close of the first century. The author is concerned that "no one may deceive you by fine-sounding arguments" or "take you captive through hollow and deceptive philosophy." He emphasizes that "in Christ all the fullness of the Deity lives in bodily form." Christ also provides spiritual circumcision to believers, who were "buried with him in baptism and raised with him" from the dead through faith. Therefore, believers should not allow themselves to be judged by anyone on the basis of such things as the proper celebration of various feasts and sabbath days. 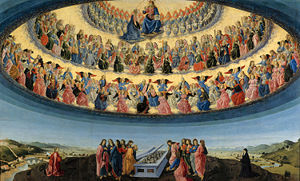 Nor should Christians be tempted by such traditions as the veneration of angels, for such practices are based on idle speculation and spiritual pride. Ascetic practices should also be rejected. Those who engage in such restraints may have the appearance of wisdom, but there is no real value in their "false humility and their harsh treatment of the body" (Chapter 2). Although such teachers pretend heavenly knowledge, their minds are actually focused on the earth, rather than on Christ. Those who share in the Christian life must "put to death" the earthly nature, especially as expressed in "sexual immorality, impurity, lust, evil desires, and greed, which is idolatry." They must also show kindness and compassion toward one another: "Forgive as the Lord forgave you." Their lives should be filled with gratitude, thanksgiving, and spiritual songs. Wives must submit to their husbands, husbands in turn should love their wives, children should submit to their parents, and Fathers must not discourage their children, slaves must obey their masters, and masters should not abuse their slaves (Chapter 3). Finally, a Christian's life should be full of prayer and thanksgiving. Tychicus, the author states, would be the bearer of the letter, and he will inform the Colossians of the state of the Apostle (4:7-9). Accompanying him will be Onesimus, the escaped slave who had been converted to Christianity by Paul and may now be returning to his master, Philemon, in Colossae. Greetings were sent from several persons with Paul, including Epaphras, Mark, Luke, and Justus. Paul directed the church to exchange this letter with an earlier one (now lost) that he had been sent to the neighboring Laodicean Church. He then closes the epistle with a salutation in his own hand. Theologically, the letter to the Colossians is important for two main reasons. First, more than any other "Pauline" letter except Ephesians, it is characterized by a "high Christology," in which Jesus is not only the risen Messiah, but also the person by whom all things were made, and in whom "the fullness of God" is incarnate. These verses became key proof texts in the development and defense of the doctrine of the Trinity and the Incarnation. Second, Colossians is important for its rejection of mystical speculation and asceticism, especially of the Gnostic variety. At the same time, it stimulated Christian speculation into the nature and function of angels, so that Paul's "thrones, dominions, principalities, and powers," each became a distinct type of angelic being in Catholic tradition. As a source of historical investigation, the implications of Colossians depends on whether one considers it truly Pauline or not. If so, it gives an insight into a form of Christian Gnosticism which had affected the Colossian church at a relatively early date. If not, it tells the reader more about what the churches of Phrygia faced in the late first century than during the time when Paul was still alive. Lohse, Eduard. Colossians and Philemon; A Commentary on the Epistles to the Colossians and to Philemon. Fortress Press, 1971. History of "Colossians, Epistle to the"
This page was last modified on 13 March 2017, at 22:22.